For a bowling alley, I need an image in size 296px by 196px. as example of an idea which direction i'm looking at I attached 3 images collaged into one. If the image made is liked there will be a second order of another 5 images. 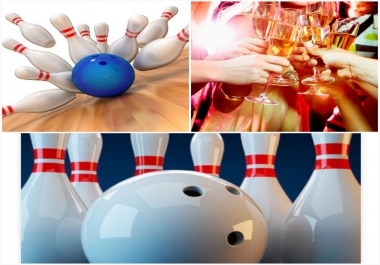 These images will be used to show categories to customers on a website, for example: bowling, bowling & Dinner etcetera. This first image I would like to be for one of the easier more direct categories being: kids birthday parties One thing to keep in mind making this is that the images will be used on both computers aswell as phones, so the image will be scaled down to a smaller size by a script when showing them on phones. So in short, i'm looking for an image to "describe" the category Kids Birthday Parties, inside a bowling alley. I'd like the image to have a professional look, nice, shiny, sharp, but at the same time giving a leisure feel. Any questions, please don't hesitate to message me.